QUESTION: What is the Vaishnava feeling on silent maha mantra mediation? I read that Prabhupada said that loud and silent Japa were both “good” as long as they were sincere. Śrī Rūpa says that japa is “sulaghu” – “very light enunciation the mantra.” Don’t try to wake the dead. Chant very lightly. Aim to bring the sound to the inner ear by increasing the “lightness” of our enunciation. Hari bhakti vilāsa identifies three valid approaches to japa (1) audible, (2) mouthed, (3) mental; saying that each one is more powerful than the one before it. Thus the opinion of the founders of Gauḍīya Vaiṣṇavism is that silent chanting is the most powerful, but they wouldn’t have enumerated three other types unless those other types were also useful. My conclusion here is that we have to proceed from audible chanting to mouthed chanting to silent chanting. Going straight to silent chanting prematurely is too difficult and amounts to almost not chanting anything at all. In other words, though silent is best, for some people audible may be the best. If we are not very attentive, audible is better than silent because with audible chanting at least we are making the noise associated with the pure name. When silent chanting is inattentive we are doing nothing at all besides daydreaming. If we are not very attentive, audible is better than silent because with audible chanting at least we are making the noise associated with the pure name. Silent chanting is not inaudible, it is heard by the internal ear. Everyone has and uses an internal ear all the time. Imagine some sound, and you are using your internal ear. When you dream you also often solely use your internal ear. Whenever you hear, actually, your external ear is merely feeding data to the internal ear, which is the actual sense of hearing itself. The second type of japa (“mouthed”) is the transition from external to internal hearing. 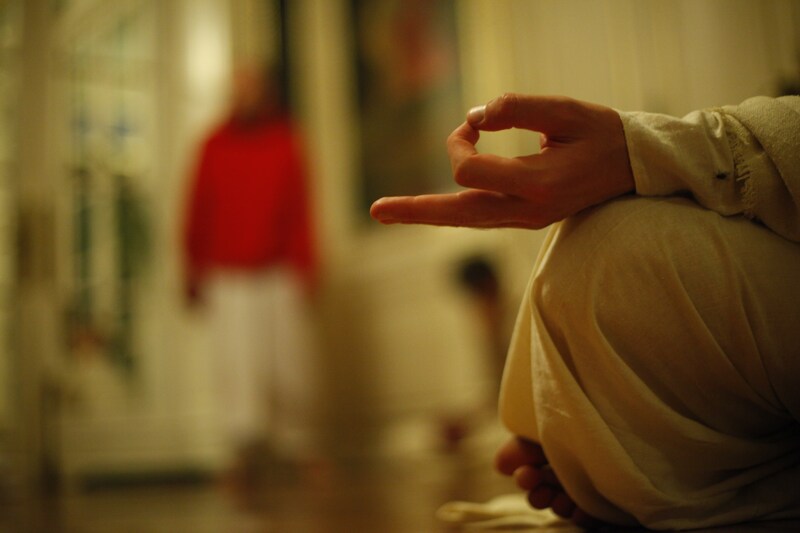 Silent chanting is the best because the focus is full. But if we do silent chanting prematurely, or as an imitation of something “advanced” we will still be rocking around, swaying, shaking beads, etc. so that we can keep progressing from one bead to the next without actually hearing the mantra with our inner ear at all. With audible chanting, even on autopilot at least there’s some sound drifting in our ears occasionally catching our interest. With mental chanting, when we go to autopilot, what’s left? Basically nothing except wasted time. Previous Why Can’t I Live up to my Ideals? loud chanting is 100 times more powerful than silent chanting, for it benefits all being who happen to hear the chanting. How can there be sound vibration if it is silent? How can the atmosphere around me be cleaned? How can there be attraction if there’s no vibration? I just started encouraging devotees to come to the temple early in the morning 3:00/4:00am to chant their rounds. The idea being to that congregational chanting would bring good positive vibration and help cleanse the atmosphere. Can this also be achieved through silent chatting? I am interested in understanding any means of making a positive impact. New people should chant audibly, but quietly. Gross sound vibration is the external manifestation of subtle sound vibration. All of the tan-matra (sense perceptions) are in the mind, including sound, the external sense objects stimulate their internal perception. The atmosphere is cleaned when its occupant is cleaned. The attraction is to the inner vibration, and to the entity being named.